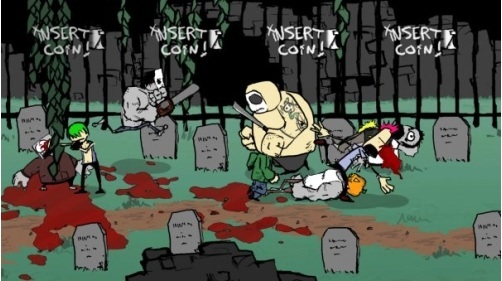 Indie developer James Silva has captured our co-op hearts in a most gory and interesting way. Previously recognized for the dark 2 player co-op Dishwasher: Dead Samurai XBLA title and the quirky local co-op I MAED A GAME W1TH Z0MB1ES 1N 1T!! !1 indie title, James seems to be taking his previous ideas and blending them for a new co-op indie game called Charlie Murder. Charlie Murder will be showing its game face in March, originally believed to be a sequel to Dishwasher. We don't have a price point just yet, but when we do you'll be the first to know. "Based around the lives of fictional punk band Charlie Murder, Ska Studios' latest tasks players with rescuing frontman Charlie's girlfriend, Skelekitten, from the vile clutches of rival metal group Gore Quaffer. Expect lots of ninjas on motorcycles, zombies, and other unspeakable horrors standing in the way of justice." Page created in 0.3178 seconds.